You can find the page covering the auction at this link. There is a photo gallery. Just a short note to let my readers know to look at the auto-updating blog roll widget in the right sidebar for three newly added blogs. The associated websites are below. All of these have very interesting and timely information which I find greatly expands the kind of coverage I offer in that blog roll. The last listed blog above has a very interesting post made yesterday about the founder of that operation's long and unheralded struggle as a pro-nuclear environmentalist, dating back to well before the current bevy of those so prominently featured in press and film. Check them out, and bookmark them! I look forward to some fresh content now and again and these are great additions. It's time for the 195th Carnival of Nuclear Energy! Every week, the Carnival appears at a different blog and showcases the best English-language, pro-nuclear bloggers and authors the world over. Before we get to the entries it's customary at Atomic Power Review to have a guessing game. So, take a look at this photo and tell me ... "What is this?" You can click on the photo to enlarge it. The real subject of the photo is the dark object near the center, sitting on what looks like an angle-iron shaped tray or slide. The object is oblong. You could also tell me what the photo is generally or even (perhaps) where it was taken. Or what the machine is that we're looking at. 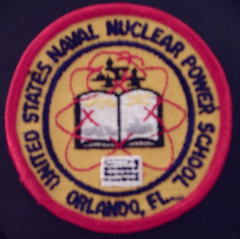 Yes, of course this is nuclear related, and no, I really don't have a good hint for this one. The answer, and more, after the Carnival entries! With the interest in earthquakes and nuclear power plants being so important, and especially so in the decisions on restarting the shuttered nuclear power plants in Japan, Gail Marcus reports in Nuke Power Talk on a paper analyzing the faults around the Tsuruga plant in Japan. The paper not only explains the geological characteristics at that site, but in so doing, lays out some of the major factors considered in arriving at their conclusion, thus providing a useful tutorial for those of us who need to understand more about earthquakes and how the probability of seismic events is assessed. Why did a major pension fund just decide to invest hundreds of millions more dollars into an Ontario nuclear plant? Because that plant, being the biggest clean energy producer in the western hemisphere, makes billions of dollars worth of electricity every year. It does so by selling its electricity at a cheaper price than almost every other source, which makes it an enormously valuable public asset. As Steve Aplin of Canadian Energy Issues points out, this offends supporters of competing electricity sources that are not only more expensive but come with heavy carbon emissions. Well, boo hoo for them. South Korean Nuclear Power - Are the Dark Times Over? At ANS Cafe, Will Davis examines the recent very public setbacks experienced by the nuclear energy program in South Korea, and takes a look at how the program is coming out of troubling times with a new mindset (and new scrutiny) and is already checking off successes. Is fracking all it's fracked up to be? Angwin describes a Dartmouth engineering school seminar which echoes her own conclusion that low prices for shale gas are part of a transient bubble. They are not the new world order. Gas Pipelines and Fees. Both are on their way. Angwin notes Vermont's plans to tax gas pipelines to fill the Clean Energy Development Fund. Vermont Yankee had been forced to pay tens of millions into that fund. Now, the Vermont administration is looking for new sources of funding for their favorite renewable projects. Is there Fukushima Radiation on the US West Coast? Les Corrice presents a summary of the contamination issues relative to the North American Pacific Coast. As of February, 2014, no Fukushima isotopes had been detected. Concern is mounting in the Obama administration over a growing number of nuclear reactors that are being closed prematurely, for no reason other than a failure of the energy market structure in the United States. These threaten America's ability to achieve any emissions goals in the future. That's it for this week's entries. Now all that's left is to let you know what exactly that non-identifiable object was and why it was sitting on that highly obscure contraption. "EBR-2 Fuel. The AEC's Experimental Breeder Reactor No. 2 (EBR-2) at the National Reactor Testing Station in Arco, Idaho began producing electric power in August, and during September the first irradiated fuel elements were started through the recycling process in the integrated fuel reprocessing system. The EBR-2 is the first such fully integrated plant. Photo, taken through a 5 foot thick radiation proof window in the Fuel Cycle Facility, shows the first uranium ingot (center of photo) ever produced from irradiated fuel by the Argonne National Laboratory-developed pyrometallurgical reprocessing method. The EBR-2 fuel subassembly from which the ingot was reprocessed had reached an estimated 0.1 atom percent (a/o) burnup and was allowed to cool 30 days before reprocessing. Such ingots are refabricated into fuel elements and returned to the reactor for further use by remote-control equipment." This photo can be found on page 91 of "The EBR-2 Fuel Cycle Story" and shows the IRAS device; this stands for Ingot Remover and Sampler. Starting at the top right arrow and moving clockwise we see the tilting slide tray, the sample shear, sample cans, the can capper and the ingot holder. The function of the IRAS was to remove uranium ingots from their molds first, then shear off two specially made small protrusions at the base of the ingot (which you can see in the earlier photo.) It also used the "can capper" to place lids on the sample cups into which the protrusions were placed; these sample cups were then placed into the hexagonal aluminum sample can indicated by the bottom arrow. These sample protrusions were sent to the analytical laboratory; the ingot was then placed into a steel transfer and storage container. Containers were stored on wall racks in a "critically safe geometry" while waiting to continue on down the fuel fabrication process. 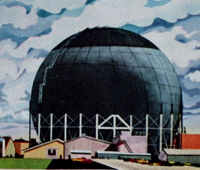 What is fascinating about the whole EBR-2 project is that all of the fuel reprocessing equipment and the reactor itself were contained in the same enclosed facility, seen below in another illustration from "The EBR-2 Fuel Cycle Story." 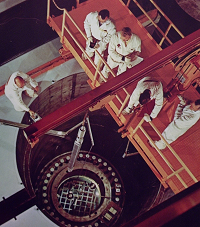 The EBR's fuel recycling project ended in 1969; the decision had been made to continue metal cooled breeder reactor technology using a different technological path for the fuel cycle (aqueous instead of pyrometallurgical reprocessing) and even that proved stillborn when the Liquid Metal Fast Breeder Reactor Program was cancelled in the early 1980's. 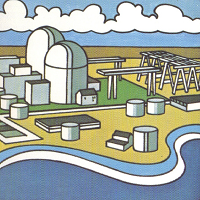 The EBR-2 (or EBR-II if you'd like) reactor itself continued to operate for other purposes until 1994 when it was shut down for the last time after funding was cut off. I do highly recommend this book, still available from the American Nuclear Society, for those interested in the history and in the process itself. You can also click here to see Argonne National Laboratory's page on fast reactors; scroll down a bit and find the "EBR-II" tab. That's it for this week's Carnival post. Thanks for reading! First, South Korea's nuclear regulator (NSSC) has expanded its investigation into falsified or inadequate certification for nuclear plant parts to include parts made outside South Korea, including such parts made as far back as 2008. According to reporting by Yonhap News, eight certificates for such imported parts have been found in an initial investigation which will stretch to over 37,000 certificates eventually. As I've reported here and elsewhere, South Korea will leave no stones unturned in rooting out these problems. At the moment, the sources of the parts (nations, names of manufacturers) have not been released publicly on the NSSC website. Second ... It was reported at the end of January in Jane's Defense Weekly that North Korea had restarted its Yongbyon reactor. This is not really a surprise, but the Jane's report included an eyebrow raising amount of fear mongering over the design / construction, age, and operation of this particular reactor. It took a short while, but eventually this report was picked up by news agencies publishing from within South Korea including Business Korea on 6 February and also (by way of editorial) the Korea Herald on 7 February. The apocalyptic headlines augur disaster on a scale parallel with the Chernobyl accident and, in the body of the Korea Herald op-ed, promise worse things should a theoretical fire at the Yongbyon reactor itself spread to other nuclear related buildings on site. Does everybody understand that the Yongbyon reactor has a twenty or twenty-five megawatt rating? Does everybody understand that the rating of the Chernobyl unit which suffered the accident back in '86 was about three thousand two hundred megawatts? (These are core thermal ratings.) So the rating of the Yongbyon reactor is six tenths of one percent of that of the RBMK-1000 used at Chernobyl. I just have to tell you, readers -- that's not going to cause a "disaster on a Chernobyl scale," even if the quite unlikely circumstances the "experts" predict occur, because it's just TOO SMALL. That plain fact doesn't work well with the apocalyptic message contained in the Jane's report, so I naturally decided to figure out who it was - really - that was saying these things. I decided to pursue the qualifications ... or motivations ... of one of the listed "experts" who was not in or from the country - Peter Hayes, listed in the Jane's report as being from the Royal Melbourne Institute of Technology. I'm not going to go into detail as to what I found. Suffice it to say that Hayes is associated with a number of energy policy and nonproliferation interests, including the Nautilus Foundation, which is an organization that seems to believe in the "Nuclear Establishment" belief - this is the belief that all things nuclear are inextricably linked in governments, in policies, in the actual operative sense, and in the mind of people and therefore each and every time nuclear energy comes up in any discussion so must nonproliferation. Claims made by the contributors to this article - all of them - generally fall flat on technical inspection as related to the scope of any potential accident here when compared with Chernobyl. Too small. Tiny core inventory compared to RBMK-1000. Not a realistic comparison. Further, relating back to the Jane's article, there's no good reason to make any such statement as "it's unclear whether or not Chernobyl experience is taken into account operating the Yongbyon reactor" - a statement made in the Jane's article that's not attributed specifically to any of the named contributors. If it's unclear, then it's unclear; if you don't know, you don't know. That doesn't mean it is or isn't. But the deliberate inference is that it isn't - and that's just a hair away from telling a lie. South Koreans have far better things to worry about than this when they choose to worry. One might choose conventional war with North Korea, or else perhaps a nuclear weapons test in North Korea that vents unintentionally to the atmosphere before one chooses a graphite fire at the Yongbyon reactor that somehow spreads to the entire complex. It's important to understand that while the accident at Chernobyl-4 occurred in April, 1986, Chernobyl-3 right next to it continued operating until the year 2000. The other units also operated for a number of years after the accident. The site did not burn down; there's no reason to expect it to. Neither did anything of the sort happen at Windscale in the UK. These assertions of a site-clearing fire are essentially without merit. As readers here know, I've been keeping a close eye on nuclear energy in South Korea for some time now, and have recently published an article on it at the ANS Nuclear Cafe site. I'll also keep an eye, now that I see developments, on the potential anti-nuclear element spreading in South Korean press. ROSEMEAD, Calif., Feb. 6, 2014 — Southern California Edison (SCE) announced today that David G. Victor, a University of California, San Diego professor and expert on energy markets, will serve as chairman of a new Community Engagement Panel (CEP) to foster public education and involvement during the decommissioning of the San Onofre nuclear plant. Victor, 48, a professor of international relations and director of the Laboratory on International Law and Regulation at UC San Diego’s School of International Relations and Pacific Studies, is recognized among energy leaders as a forward-looking voice on critical energy issues, said Ron Litzinger, president of SCE, the majority owner of San Onofre. Victor said his work on the board of Electric Power Research Institute and as chairman of EPRI’s Advisory Council for two years helped prepare him for the CEP role. The CEP will serve as a conduit of information between the owners and the public. Organizations and their representatives that have accepted invitations to serve on the CEP include: American Nuclear Society, San Diego Chapter (Edward “Ted” Quinn); Capistrano Unified School District Board of Trustees (President John Alpay); Dana Point (Mayor Lisa Bartlett); Laborers International Union of North America Local 89 (Valentine “Val” Macedo); Oceanside (City Councilmember Jerome M. “Jerry” Kern); Orange County Coastkeeper (Garry Brown); Orange County Sheriff's Department (Donna Boston); Orange County (Supervisor Pat Bates); Residents Organized for a Safe Environment (Gene Stone); San Clemente (Mayor Tim Brown); San Diego County (Supervisor Bill Horn); San Juan Capistrano (Mayor Sam Allevato); and South Orange County Economic Coalition (Jim Leach). Organizations that plan to participate and will name a CEP member later are the California State Parks and Camp Pendleton. The owners also are in the process of inviting members to represent academia and environmental research. Leading the effort for Edison International is Chris Thompson, vice president of Decommissioning. Thompson will oversee the decommissioning process, working closely with Tom Palmisano, SCE vice president and chief nuclear officer. Thompson will place special focus on making sure the company keeps the lines of communication open with the community. Thompson, who joined Edison International last August, previously was chief of staff to Sen. Dianne Feinstein. Last week, the San Onofre co-owners announced the safety, stewardship and engagement guiding principles for San Onofre decommissioning, including creation of the CEP. SCE intends to complete decommissioning as expeditiously as possible. Litzinger noted the guiding principles call for safely moving San Onofre used nuclear fuel, currently in cooling pools, into dry cask storage as quickly as possible until the federal government, as required, develops a permanent solution. The CEP will hold public meetings at least quarterly to offer input on key decommissioning issues. These include the timing of transferring used nuclear fuel from pools to dry cask storage and SCE’s blueprint for decommissioning, a detailed document called a Post-Shutdown Decommissioning Activities Report to be submitted to the U.S. Nuclear Regulatory Commission (NRC) by mid-year. Updates about the CEP will be available on www.songscommunity.com, along with information about CEP members and the decommissioning process, including NRC oversight. 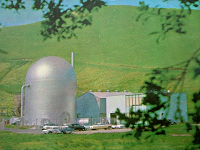 The current owners of San Onofre are SCE, San Diego Gas and Electric and the city of Riverside. The city of Anaheim was a previous owner. Current and previous owners are responsible for decommissioning. • We commit to safely decommissioning San Onofre. • We are determined to complete the safe decommissioning of San Onofre as expeditiously and cost efficiently as possible. Our immediate goal is to safely move the power plant’s spent fuel, now cooling in pools, into dry cask storage as quickly and as carefully as we can until the government creates the long-term storage option that it has committed to implement. We will continue to urge the government and other stakeholders to find a solution to provide the timely removal of spent nuclear fuel from the San Onofre site. • We are committed to leaving the community better off as a result of having been home to San Onofre for 40 years and we will be open to exploring opportunities for doing so with our landlord, the U.S. Navy, and the community. • Substantial dollars have accumulated in Nuclear Decommissioning Trusts through customer contributions and judicious investing, and the owners recognize their legal responsibility to spend those funds wisely and return any unused monies to ratepayers. • We want the San Onofre decommissioning process to be managed in an inclusive, forward-thinking and responsible way. In particular, the current and previous owners of San Onofre are committed to creating an advisory Community Engagement Panel (CEP) to bring together diverse stakeholders and open a conduit of information and ideas between the owners and the public. The panel would ensure that all key interests are included and heard: Elected representatives of the surrounding cities and counties, the military, local environmentalists, business, labor, customer interests and academia. One of my favorite pro-nuclear communicators, Kirsty Gogan, has just launched a new blog which is entitled "Kirsty Gogan - Re-articulating the energy and climate debate." Judging by her admirable first post, she'll be doing exactly that through her clear reasoning, clear messaging and common sense that can appeal to both political sides. I've been an admirer of her content and style for some time now and am very pleased to see her throw in on the fray in a new venue. Note: She's not just conversant in nuclear energy, either. She brings a lot to the table. So go read it now. That is all.